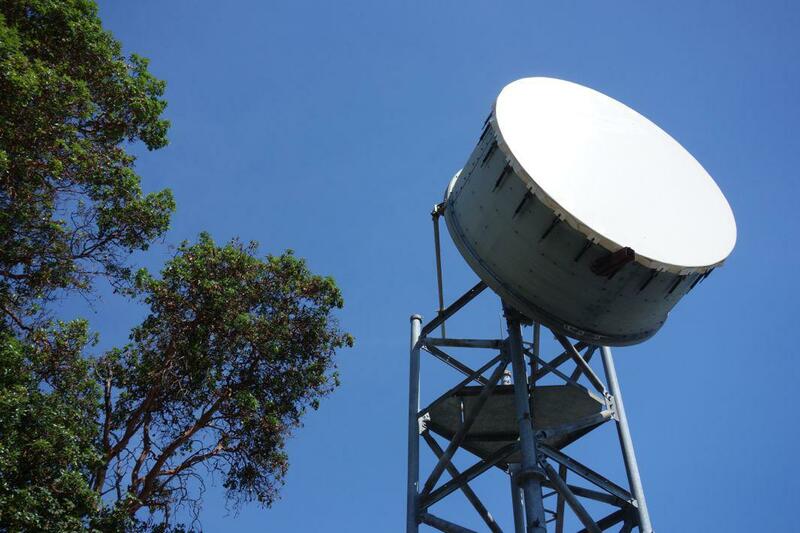 What's That Thing: Microwave radio antennas that transmit phone and Internet data. 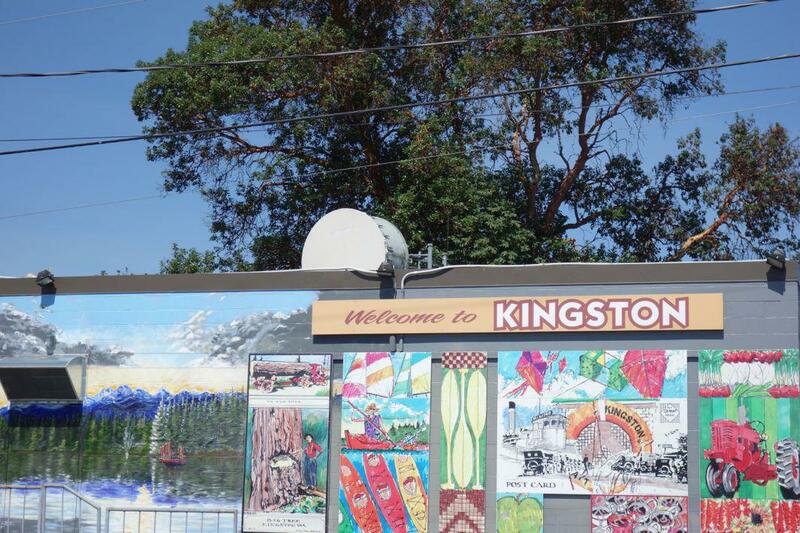 What is that drumlike object on this brightly decorated building in Kingston, Washington? On a recent vacation to the tranquil waterside town of Kingston, Washington, I wandered off the folksy main street and saw the large drumlike thingamajig pictured above. Perched atop a utilitarian but brightly decorated building, it points out above the town toward Appletree Cove and Puget Sound. At first I thought its purpose might be nautical—the town’s busy ferry terminal isn’t far away. Perhaps some sort of electronic guidance for docking, or a visual beacon that’s temporarily covered? Andrew Blum, the author of Tubes: A Journey to the Center of the Internet (required reading for learning about the physical structures that conjure the Internet’s virtual realms), told me the object is a point-to-point microwave radio antenna, an old-ish example of a technology that’s regularly used today to transmit telephone, Internet, and other data. This sort of antenna for microwaves (a term that refers to the wavelength of the electromagnetic waves used) has three parts, says Anton Kapela, chief technology officer and a vice president at 5Nines, a technology company based in Madison, Wisconsin. 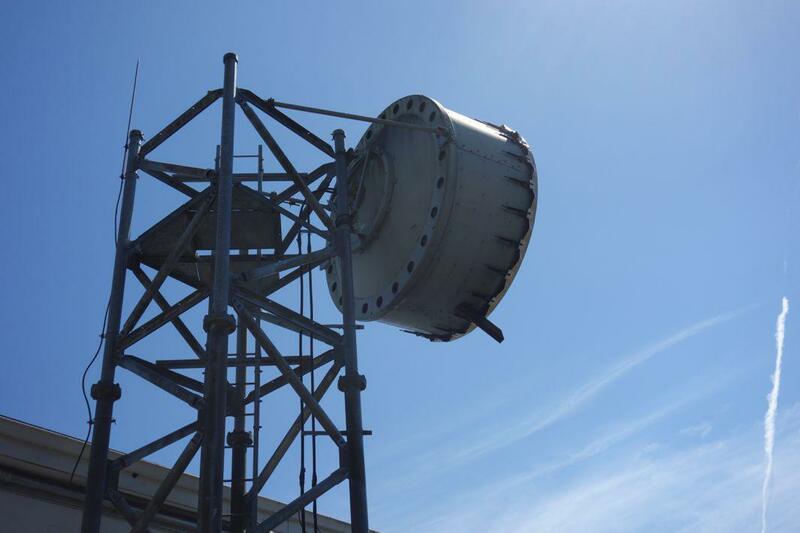 There’s the feedhorn, which transmits and receives the radio waves; the curved reflector, which gathers and focuses the radio waves; and the outer drumlike cylinder. This cylinder looks rather ominous—simultaneously rugged and high-tech—but it’s only a shield. It helps ensure that the feedhorn doesn’t transmit or receive energy sideways. Compare it, Kapela suggests, with the “crude” shield around a stage light that simply directs energy at its intended target, such as a dancer onstage. In the case of a microwave antenna, the target is another antenna, perhaps many miles away. Microwave transmission technology has been around since at least the 1930s. Jim Perry, a plant facilities supervisor with CenturyLink, the telecom company whose name graces the building I saw in Kingston, told me that engineers still have plenty of reasons to use microwave technology to move data around the countryside. He says that Washington state, like certain other parts of the American West, is a great candidate for microwave transmission because mountainous terrain and large bodies of water can make fiber optic cables expensive or difficult to install. Data sent by microwave can leap valleys and lakes in a single, cost-effective bound. 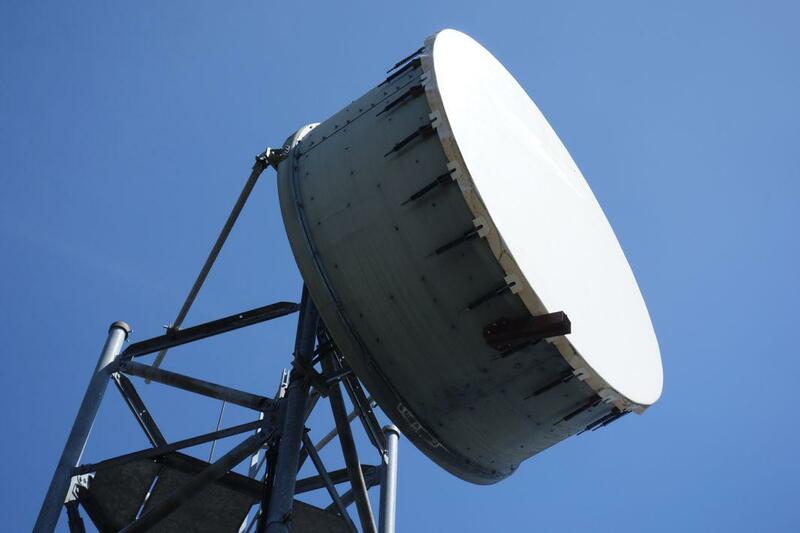 But microwave technology requires a direct line of sight, which is why antennas are typically installed atop buildings, towers, or mountains. That can make installation a tricky business. The other half of an antenna pair can be very far away; Perry says that his company has a “microwave shot” in Arizona that runs about 90 miles, from Mount Elden to Page. Once the two antennas are in place, they need to be aligned, a delicate process in which technicians behind each antenna communicate via headsets while firing specialized test signals across the ether. After installation, the antennas have to survive whatever Mother Nature throws at them. No surprise, then, that technical specifications for antennas include the weight of the antenna when ice has formed on it, the amount of twisting the antenna structure can cope with, and the maximum windspeed it can withstand (aka the “Wind Velocity Survival Rating”). Antennas high in the mountains have it rough, but Perry notes that “antennas sitting next to salt water for almost 30 years tend to get pretty worn out,” too. 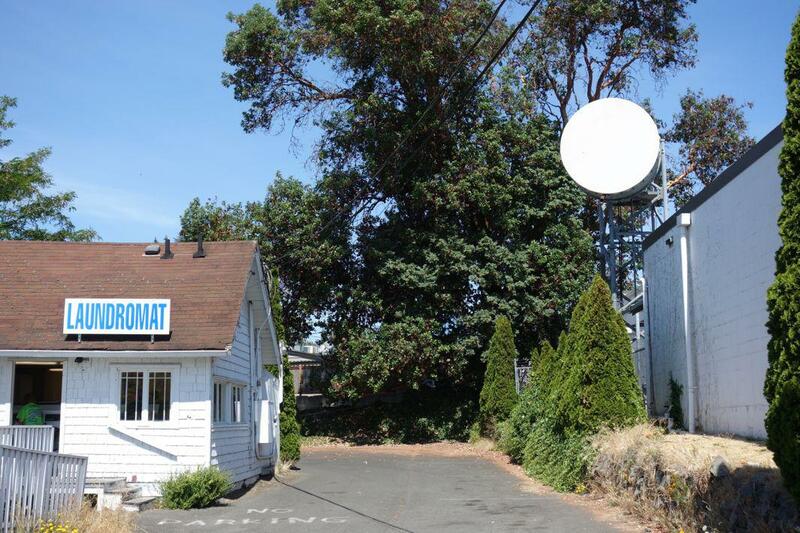 What happens to old antennas? The junkyard, for most. But Perry told me a tale about a colleague of his who asked for an old antenna to take home. 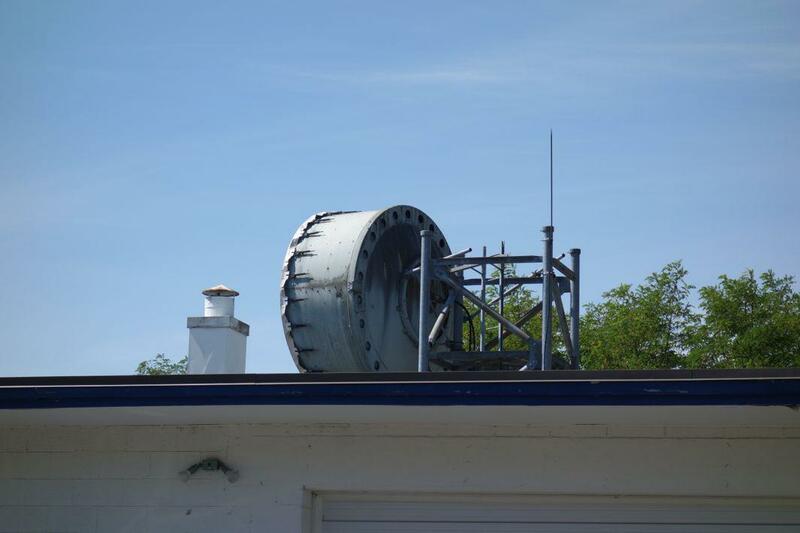 Later, Perry says he visited his colleague’s house and found two old microwave antennas buried in the backyard. The colleague had plugged the holes and filled the antennas with water, and there were ducks floating around in them. 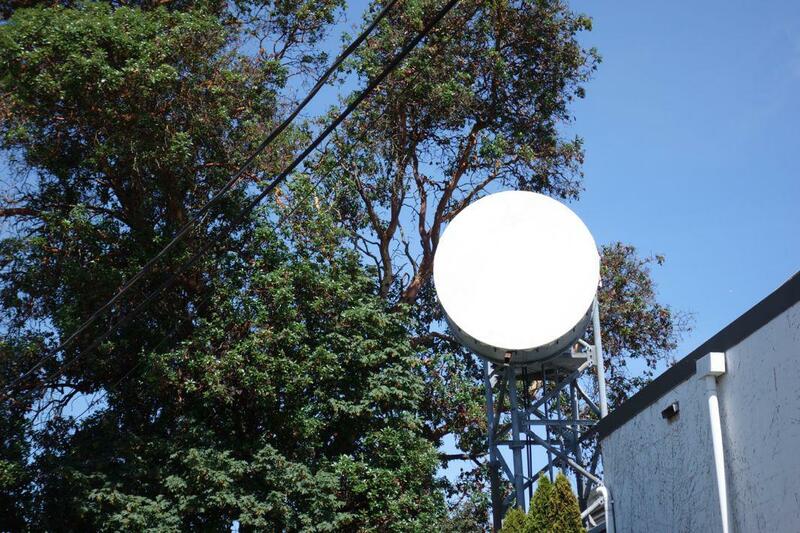 Perry says that the Kingston antenna that caught my eye (which in its heyday was able to handle 1,344 voice channels) is no longer in service and will likely come down soon. So if you’re in the market for a recycled duck pond that can survive ice, high winds, and maybe even an earthquake, Jim Perry is your man. See something in the city or the countryside that you’re wondering about? Send a pic and description to whatisthat@markvr.com.